Iserror, Iferror function in excel, We might experience some error while working in Excel. 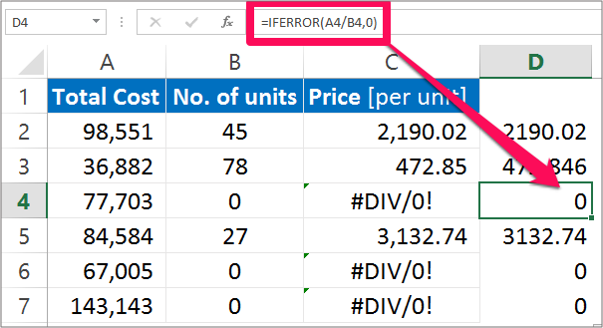 In this tutorial we will see how to use IFERROR, ISERROR Function in Excel in order to deal with the errors. Let us take a look at these two function one after the other. The ISERROR Function returns TRUE if there are any error value in the cell and FALSE if there are no error value in the cell. This function applies to all the version of Excel from 2000. Value: Here you enter the value that you want to test. If value is an Error value it will return TRUE otherwise it will return FALSE. An Example below will help you to know about ISERROR function in Excel and how it works in Excel. a. Below is the list of Material. We see error in the image below. b. Using the ISERROR formula to see if the cell contains Value error. The result will appear TRUE or FALSE. Here the cell D3 returns True Value as it the cell contains error. Also cell D6 and D7 return True value. NOTE: There is difference between ISERR and ISERROR function in Excel. ISERR does not take #N/A error into consideration where ISERROR includes this error in the value. If the value argument is an error then return the value_if_error. IFERROR function is far more efficient that the ISERROR function. Value_if_error is the value or formula or expression that you want IFERROR formula to return. NOTE: Whatever value in enter in the value_if_arguments it will return that corresponding value. This function applies to all the Excel version after 2007. It is a worksheet function and it returns some values as string or number etc. 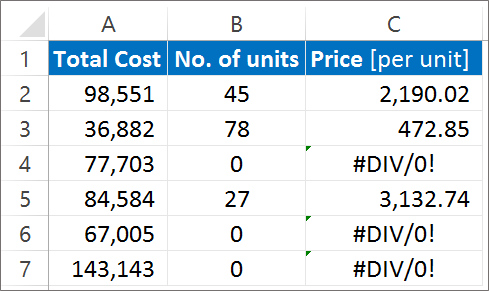 Based on our example Column C contains the formula to calculate the price per unit. a. In our example, Cell C4, C6 and C7 contains errors. b. Column D in the spreadsheet will show you the result of IFERROR function. Enter the IFERROR formula as =IFERROR (A2/B2, O) and If the value argument contains numbers it will return number as the result. But, if the value contains error it will return 0 as the result. TIP: If you put (“”) in place of zero in the formula, the result will be a blank cell. It is though equivalent to zero. Hope you like our tutorial on iserror, iferror function for more cool and amazing trick of excel Like our Excel Superstar Facebook Page and subscribe to our Excel Superstar YouTube channel. Excel Superstar is the leading online training company, which provides Online Excel Course in Hindi. Connect with us and become an Excel Superstar.